Its builders failed to anticipate "accelerated Arctic warming." Roughly 800 miles from the North Pole is a concrete building meant to feed humanity in case global disaster strikes. 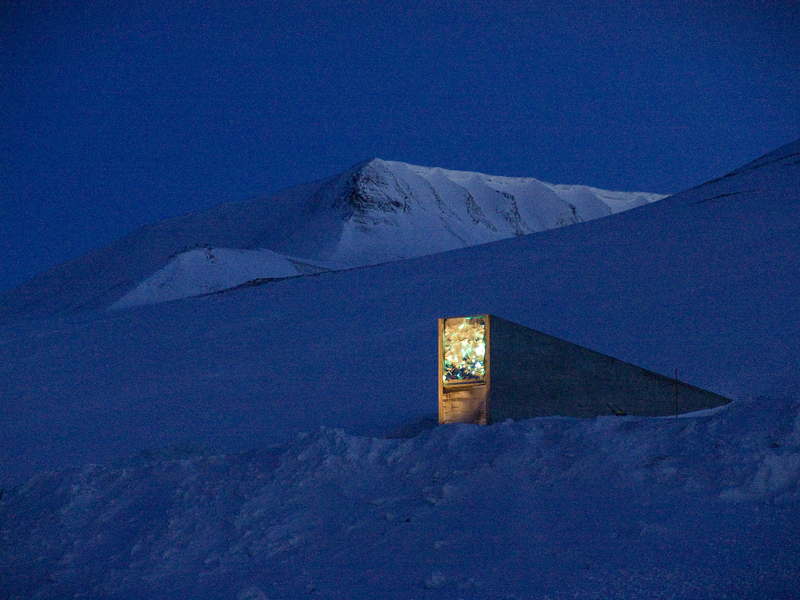 The Svalbard Global Seed Vault, tucked 390 feet into a mountain on snowy Spitsbergen Island, contains nearly a million seed samples that can be used to regrow crops in case a planetary emergency threatens our food supply. Unfortunately, its builders didn’t anticipate that an emergency would come so soon. A CNN report on Wednesday, partially based on research published by the Norwegian Centre for Climate Services (NCCS) in February, revealed the islands that make up the Svalbard archipelago where the Seed Vault is located are experiencing rapid warming. The temperature is already four to 7.3 degrees Celsius warmer in Svalbard than it was 50 years ago and, at the rate the climate is changing, is expected to become seven to 10 degrees warmer by 2100. All that warmth is melting the permafrost, which is essentially the bedrock on which all the structures in the region — the Seed Vault included — are built. Already, homes are becoming increasingly unstable and prone to collapse as their once-solid base softens and sinks. Svalbard, in relation to the Americas. It's very close to the North Pole, but even that's not enough to keep it cold. 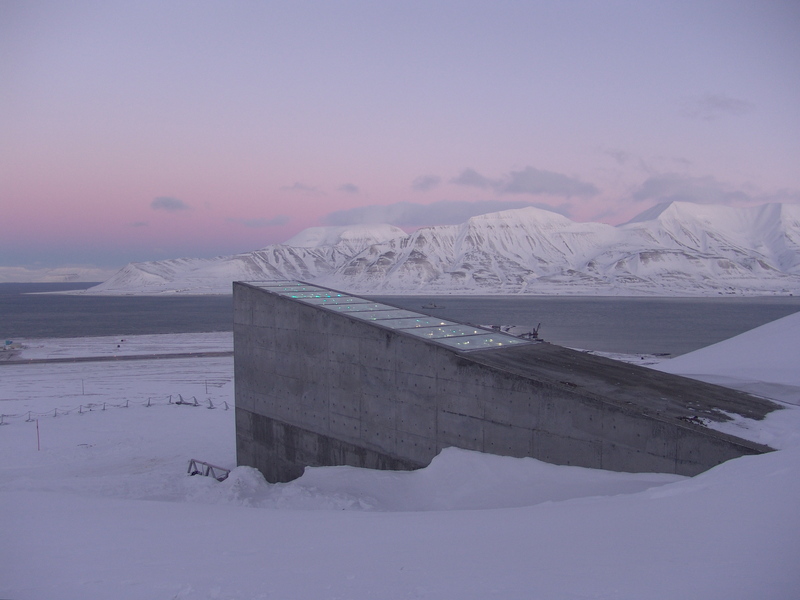 The Svalbard Seed Vault is one of 1,700 seed banks worldwide, all of which store a wide variety of plant seeds in case a wide-scale crisis wipes out the crops. Svalbard is special not only because it’s the largest of the vaults but also because it contains duplicates of all the seeds in the seed banks worldwide — somewhat like a backup hard drive. As anyone with a computer prone to crashing knows, a hard drive is crucial. The “doomsday” connotations around Svalbard may suggest that it will only become useful in the event of some far-off catastrophe, but it’s already had to be cracked open. When fallout from the Syrian war damaged the Aleppo seed bank in 2015, scientists had to open up Svalbard to retrieve the copies they left there for safekeeping. Melting permafrost has already flooded the entrance to Svalbard, prompting a $13 million renovation in 2018. Climate change threatens the ability of scientists to do that during future catastrophes. Leaking water from melting permafrost flooded the entryway to Svalbard in 2017, prompting a $13 million renovation to make the entryway waterproof. The seeds weren’t damaged that time — they’re housed behind another vault door deeper into the mountain — but the water damaged electrical equipment in the entryway, reported the local newspaper Icepeople. In other words, climate change is forcing us to artificially create the conditions that led us to build the Vault near the North Pole in the first place. Melting permafrost has turned lakes and ponds in the Arctic brown. As residents of Svalbard are discovering, the permafrost is not permanently frozen, at least not in the conditions that humans have created. The Arctic is experiencing accelerated warming, Inger Hanssen-Bauer, senior researcher at the Norwegian Meteorological Institute, told CNN. As snow and ice melt away from the North Pole, it has fewer white, shiny surfaces to reflect sunlight away. The darker surfaces left behind absorb the sun’s energy, warming the region to a dangerous degree. Unfortunately, climate models predict that it is only going to get harder for us to maintain our food supply. According to the 2014 Intergovernmental Panel on Climate Change report, crop production could drop 50 to 70 percent by 2050, while the human population is expected to soar to near 10 billion people. As the permafrost melts and sea level rises, perhaps the keepers of Earth’s seed vaults should take a cue from Microsoft, which has decided to store its valuable data servers deep underwater, instead.